Everyone who has seen Frank Buck’s “Bring ‘Em Back Alive,” that amazing movie of jungle life, is asking the question: “How did they ever film that spectacular battle between a Bengal tiger and a 30-foot python? Was it faked? How did the cameramen happen to be on the sceneâ€”and how did they escape with their own lives?” Read the answer in this article. WHO won â€” the python or the tiger? 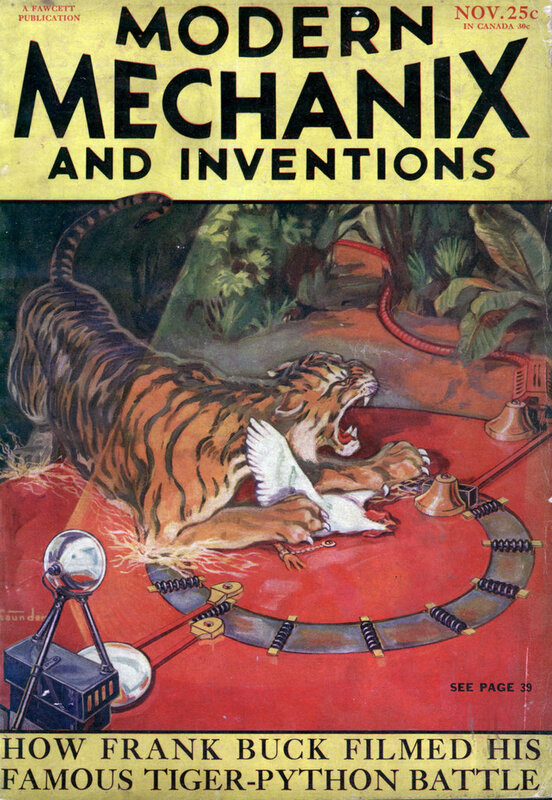 This is the question which is bothering thousands of folks who have seen Frank Buck’s startling movie of jungle life, “Bring ‘Em Back Alive,” and who have been vividly impressed by the incomparably spectacular scenes shown therein where a Bengal tiger, dreaded king of the jungle, battles the flashing coils of a deadly rock python thirty feet in length. The picture shows the battle ending in a draw. But Marquis of Queensberry rules, as interpreted by the jungle, admit of no such thing as a draw. Battles there must inevitably end in death for one or the other fighter. That is the law. How, then, did both the python and the tiger escape with their lives after their amazing battle, which endures on the screen for fully ten minutes? And how in the world did Frank Buck and his cameramen happen to be on the spot at the time? Skeptics, admitting the hair-raising effectiveness of the picture, raised the cry of “fake,” pointing to the “Ingagi” hoax. This, you may remember, was another famous jungle picture purporting to reveal the lives of apes, who were later discovered to be movie actors dressed in monkey costumes. Obviously Buck’s picture was not faked in this sense, for it was self-evident that the tiger and the python were flesh and blood creatures. But suspicions, once roused, were hard to down. So I went directly to headquarters of the expedition to find out for readers of Modern Mechanix and Inventions just how the technical and mechanical problems of making this wonder-movie were solved. 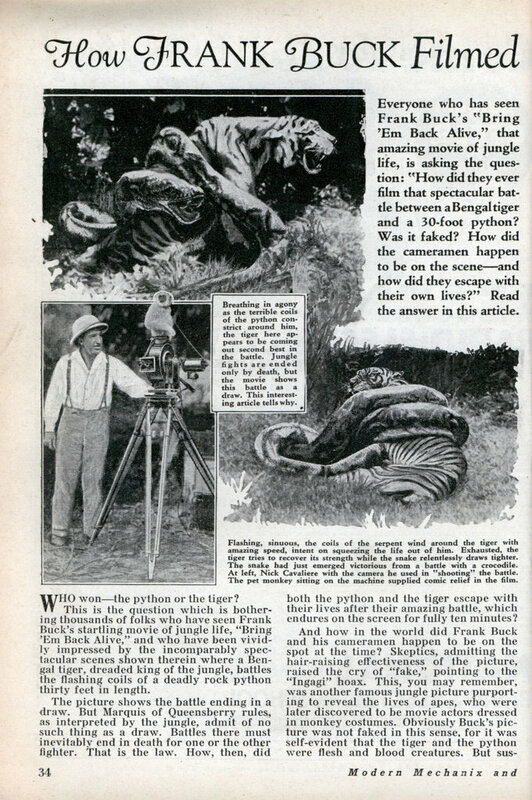 Both Frank Buck and Nick Cavaliere, cameraman who shot many of the scenes, agree that the tiger-python episodes were the most spectacular in the picture. Just what happened during the filming is going to be told you now for the first time, by special permission of the copyright owners, so to speak. The success of the whole picture revolved around so simple a thing as a jungle water hole. The expedition spotted the water hole early in the game. It was the only one for miles around, and Buck, wise in jungle lore, knew that sooner or later animals in the district would come to it. It was here that a python met a crocodile. This was not a coincidence, but strictly in keeping with the ways of jungle inhabitants. On this particular occasion the expedition was stalking a tiger which had been sighted in the vicinity by natives. Figuring that the tiger would show up at the water hole sooner or later, they repaired there, preparing their camera nests as shown in an accompanying drawing, but the first actors for their lenses proved to be the python and crocodile. In the picture you see the two reptiles splashing and threshing in the water. You see the python insinuating its coils around the body of the crocodile, which apparently puts up a tremendous struggle. In reality the crocodile was no match for the snake. In the end the python breaks its opponent’s neck. It is at this point that the tiger appears on the scene. The thirsty tiger has heard all the commotion and he becomes very curious. Warily, he peers through the undergrowth and sees the python doing away with the crocodile. However, he is more concerned with satiating his thirst at this juncture than he is with doing battle. The tiger lopes back and forth in the naturally camouflaged background. He juts his head upwards to get a view of the water hole clearing to see if the python has disappeared. After the snake slinks off, the tiger treats himself to a long and lusty drink. He must have been sick for water, as the native safari, led by Frank Buck, had stalked him that entire day in the baking sun. All the time the cameras are clicking away furiously, ensnaring gratifying results for the expedition’s leader. Throughout the proceedings Director Clyde Elliott and Frank Buck are watching the events with feverish anxiety, to make sure that movie instruments and beasts keep in range. The native hunters were withdrawn when the tiger was steered toward the watering-hole where they knew he would find adventure and a reception committee of cameramen. I am going to tell you how the shots of the fights at the water hole were obtained. Special nests were erected in the trees. These outposts were concealed by the luxuriant foliage of the region. From these high perches, which gave plainly on the battleground of the beasts, the photographers ground away. Just how these tree-garrisons were erected must remain trade-secret lore, the sole property of Frank Buck. Returning to the python and his prospective antagonist: While the snake is recuperating from the rigors of the crocodile fight in the shade of a tree, the tiger looms in its presence. The sprightly tiger sniffs the air ominously and the camera crew get their cues from Clyde Elliott to get ready to “shoot” the jungle-land battle of the century. Frank Buck, veteran of two decades of study of animal nature in the Malay land, has signalled to Elliott from his place in the tree-top that the tiger is sure to pick a fight with the snake. It is apparent to all from Buck’s gestures that there’s going to be plenty of action any second. Suddenly and swiftly the tiger lunges at the python. He gets down to serious business right off and grabs the snake by the jaw. The tiger is striving to bite the python’s head off. It is apparent that this tiger has fought pythons before. He maneuvers to keep at a distance from the snake’s deadly coils, and yet he clings with his jaws closed on the serpent’s neck. They toss and tussle and pretty soon you see the python stealthily wrap its sinister body around the tiger. The coils begin to press and tighten. Just when you begin to think that the tiger is going to join his ancestors, he manages to extricate himself and struts off. He roams around a little and suddenly returns to resume the fight, true to the code of the jungle. This time the python gets the telltale stranglehold on him and again it looks as if the tiger will soon be pushing up daisies. The snake’s grip seems to grow firmer and firmer, deadlier and deadlier. The tiger seems to be whirling helplessly, waiting on the fatal designs of the snake. But the tiger gnaws into the python’s skin, tries to seize its head, and makes a last desperate effort to save itself from being squeezed and crunched to death. The tiger’s strength surpasses that of the python. The latter’s tentacle-like grip is broken. It collapses from fatigue. The tiger slips from the python’s nooses and keeps going. That is how the battle ends in the picture. Obviously, it was a draw. But sponsors of the expedition told me that the tiger got by far the better part of the argument. The python’s strength had given out by sheer exhaustion, having been weakened in the duel with the crocodile. Only a matter of minutes had elapsed when the tiger pounced on it. The tiger, on the other hand, was satisfied that the python was vanquished. As for himself, he was just ruffled and mussed up a bit. Otherwise, I was told, the tiger would never have left the scene. Had the python fought the tiger without the previous battle with the crocodile, the serpent would have won easily, members of the expedition informed me. An examination of the python’s body showed that the tiger had sunk its teeth deeply and decisively into four places on its back. These wounds were responsible for its weakening and the eventual escape of the tiger. A native then raised the battered python’s head with a long stick. Frank Buck lassoed it with a rope and it was stuffed into a crate. Three hours later the tiger, who was pursued anew, grew weary of the chase and ran into a baited trap. It was explained that the tiger became desperate for food and as its hunters kept it moving, it was prevented from falling on weaker beasts which it ordinarily fed upon. Consequently when it scented the buffalo meat which had been placed as a decoy in a trapâ€”set up just in case such an occasion aroseâ€”it made madly for the interior of the improvised cage. As the tiger snatched at the chunk of buffalo meat, it released a thin rope, then the perpendicular door snapped down to imprison the tiger. This made two valuable trophies to bring back alive. The tiger and the python are now neighbors in one of the largest zoos of the country. Supplementing the standard types of cameras, an automatic DeVry camera was also used in getting shots of the battles featuring the python. This was to insure success. This type of camera, capable of running off 200 feet of film automatically, was installed on a tree limb and its lens trained on the scene to be filmed. It takes in everything within a radius of ten feet of the focal point. Naturally there were other exciting episodes in the picture. You see the intrepid Frank Buck capture the rare monitor lizard, sole surviving descendant of the dinosaur and mastodon clan; and you behold him grabbing the struggling python with his bare hands to jab him into a cage. And there’s the comic relief when the little honey bear unwittingly paws the slumbering python, gnarled about a tree during its siesta. The bear was a pet of the native boys. He got out of his cage and sauntered off into the jungle fastnesses. On discovering that their pet was missing, the boys set out to find him. Their last glimpse of the bear is when the startled python snatches at it and clamps it in its deadly jaws. The boys give up in despair. They realize there is no way of getting their pet from the clutches of the python. Much to their amazement, the honey bear returns to their camp a short time later. Frank Buck has no explanation as to how the playful honey bear ever got out of the python’s grip. He and the cameramen had given him up. That episode mystified them all. One of the most sensational shots occurs when the bull buffalo actually licks the tiger who is set on preying upon his herd. Frank Buck has found that the horned buffalo, by virtue of its fiercely sharp head-prongs, can vanquish the tiger nine times out of ten. Delirious shudders possess you as you behold the ravenous tiger entering a Sakai village while the unsuspecting natives disport themselves in a nearby stream. A mother rescues her infant just in time in a deserted grove as a tiger is figuring with ferocious cunning how to grab the little tot. Those are some of the surface thrills in “Bring ‘Em Back Alive.” One observes in this Van Beuren-RKO picture the composite panorama of jungle home life. Let there be no doubts about the picture having been made “on location.” It was filmed in the Malay Jungle, south of Siem, on the very line of the Equator. The forest growth bears indisputable testimony to that fact. As for the sound effects, they are artificial. The sponsors of “Bring ‘Em Back Alive” make no secret of the fact that Paul M. Robillard, the sound engineer, inserted them later. Mr. Robillard installed sound-recording equipment in the Bronx Zoo in New York City and there he captured the necessary roars, grunts, sighs and gasps, and later got these to synchronize with the emotions of the “actors” in the picture. Some of the sounds were also made by the human voice, and mechanical gadgets were used for still other noises. What has baffled most critics is the unfathomable number of “breaks and coincidences” which Nick Cavaliere and Carl Berger, the expert and versatile camera operators, encountered in the wilds of Siam and Sumatra. It must be conceded that Clyde E. Elliott, the Hollywood-bred director, also got some marvelous breaks in getting jungle troupers to “emote” properly at the right time and place. “It was eight months of patient work,” Nick Cavaliere told me. “The whole undertaking cost about $100,000. We had six cameras and 36 miles of film, and over 400 flares for night photography. Cavaliere and Berger made an exhaustive study of the region and they succeeded in learning of the experiences of amateur photographers who had been in that section before them. “That was the first time I was ever in the jungle,” said Nick Cavaliere, “and I found plenty to learn about photography in that zone. I hope that we brought back knowledge which will be of assistance to science in future work of a similar nature. “I was told that I would have great difficulty in getting good quality in my photography after three o’clock in the afternoon. I found that point to be accurate. I was told too that I must not consider ‘shooting’ anything between twelve o’clock noon and half past one. “However, with my own ideas on this matter, I tried several exposures at the forbidden time, and the results were excellent. It became my suspicion that other cameramen had no desire to work in the intense heat of the tropical mid-day sun. “In our photographic operations we worked mostly from behind blinds which were erected whenever possible against the wind in order to prevent our scent from reaching the animals. “When we arrived at the first bazaar, or ‘country store,’ one of which is shown in the picture, Mr. Buck was told by one of the Sakai natives that he had seen a thirty-foot python so many ‘spits’ away. Mr. Buck promised the native one Straits dollar, less than fifty cents American money, and a half pound of salt if he would direct us to the spot where he had seen the serpent. “The native then explained that the python had devoured an animal and would most likely be in the same place for several days. They then decided to make a clearing somewhere in the vicinity of the python’s resting-place. “This clearing, which could only be large enough for the party’s quarters, equipment cabin and animal cages, was finished in two days. Incidentally, it obviously was not large enough for any such struggles as those in which the python and the tiger later indulged; nor were the members of the party such bad campers that they would build their compound on a site so low that there would be crocodiles lying around in mud-holes. “This is as good an answer as any to the suspicion that the fights were ‘staged’ in the compound. “During the two days necessary in making the clearing a watch was kept over the comatose snake. It was several days after the clearing was made that the python came to and began to take notice. Mr. Berger and myself had been instructed in the ways of pythons. It is possible to walk in front of a python, but to touch one is to throw one’s self into the flashing coils from which the only release is death. “I was taking a picture of the python, and my only defense was the tripod and the boxes under it which contained the batteries and the box which contained the electric motor, which made a slight whirring noise. “It was the noise of the motors that got him. He was lying there sunning himself, stretched out almost full length, and about twenty feet from me. Suddenly he began to move towards the camera. “I stood it as long as I could, grinding away to beat the devil, and then I sprang aside. Well, imagine my surprise when the snake didn’t even pay any attention to me. I stood behind a tree with the others and we watched that python. He couldn’t understand the noise of the motor, but he guessed it came from the film boxes under the tripod, so he began to coil himself around the metal box. “We watched him coil himself slowly around the boxes, and he was a long time getting to the squeezing point. A couple of good squeezes and we figured our equipment would be shot to pieces and the chances would have been that we would have to come back with only disappointment as our cargo. After that one experience with a python Nick Cavaliere became a python expert and before their trek was over he had encounterd a half dozen of them, none of which gave him any worry. I saw many Frank Buck movies I recall, on Saturdays at the Dixie Theater on Broad Street in Chattanooga, Tenn during the early 1940’s. His movies have created a lifelong appreciation of animal shows. Thank you Mr. Buck. I also remember watching “Bring ‘Um Back Alive” but I think it was in San Diego. Later, in about 1947 I think, I went to movies in Chattanooga, while we lived for a few months in Soddy Daisy! I too was enthralled by Frank Buck’s movies, which of course led to an appreciation of any and all of the animal channels and documentaries that have followed. I have been back in San Diego for most of my adult life and several times a year visit and enjoy our wonderful zoo, and often wonder how many of our early collection of animals may have come from Frank Buck. I must remember to ask the next time I visit. I really enjoyed this “behind the scenes” article! I also saw this Frank Buck special as a small child. I would love to see it again. Anyone know if this is possible? Nice video. I liked it. I uber appreciate it. If the tiger was well fed, he would have won easily. Addition, it is a tiger that is still growing. If it were a tiger bigger, surely he would have exterimano the python in seconds. I remember seeing a native fall overboard from a dugout canoe in one of Frank Buck’s films. I must have been in the Amazon River area of South American because eh poor fellow rolled over in the water o reveal numerous Piranha fish clinging to him. The cameraman keep the camera on the poor guy until he disappeared under the water. It was this scene that convinced me that Piranha are capable of killing a human being. Does anyone have archive film of this scene? Appreciate a reply because just returned from the Amazon where I caught a Piranha and cooked it. It was delicious. But locals said these fish do not attack humans. Yet, recent episode of “Rivr Monsters” details 3-year old child consumed by piranha after falling in the water. Anything??? Don Witten: His movie in the Amazon was Jacaré but I don’t recall a scene with piranha. A guy goes overboard to fight a crocodile however.